2005 Kawasaki Vulcan 1500 Classic. Picture credits - Kawasaki. Submit more pictures. Review of the Vulcan 1500 Classic submitted on 2007-07-22. If your looking for a stylish cruiser that will turn heads, has everything that a HD has and more, this bike is for you. Ad a Vance Hines exhaust system and its as good as it gets. If your into taking your Gal out for a put around the country side, you will experience all the comfort and power you will need, handling is great to boot. I like the way they tucked the rad into the frame, makes the bike look very sleek. Lots of after market goodies available to spice it even more. Cons: not that great on gas, get the FI model if you ride hard and mileage counts. 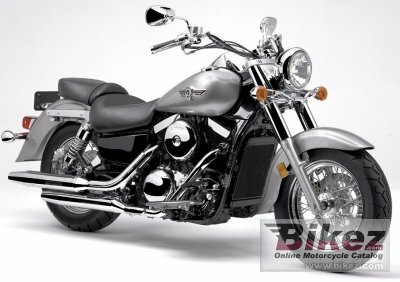 This review of the 2005 Kawasaki Vulcan 1500 Classic was posted by a visitor on Bikez.com and does not necessarily reflect facts, truth or Bikez.com's opinions. Please report profane or otherwise inappropriate content by following this link.